Prepare baked methi muthiyas as menitoned in the recipe here. Keep these baked muthiyas aside. In a non-stick kadhai, take a tsp of oil and when it is hot, adjust the flame to medium and add mustard seeds. Roast for 10 - 15 seconds. Add grated ginger, curry leaves and asafoetida. Stir gently for about 10 seconds. Sprinkle little water if it starts burning. Now add the chopped tomatoes, turmeric powder, coriander cumin powder and salt. Mix well, reduce the flame and simmer in a covered vessel for 10-12 minutes. Now drop the baked methi muthiyas in the kadhai and add 1 cup of water. Mix gently and bring to boil. 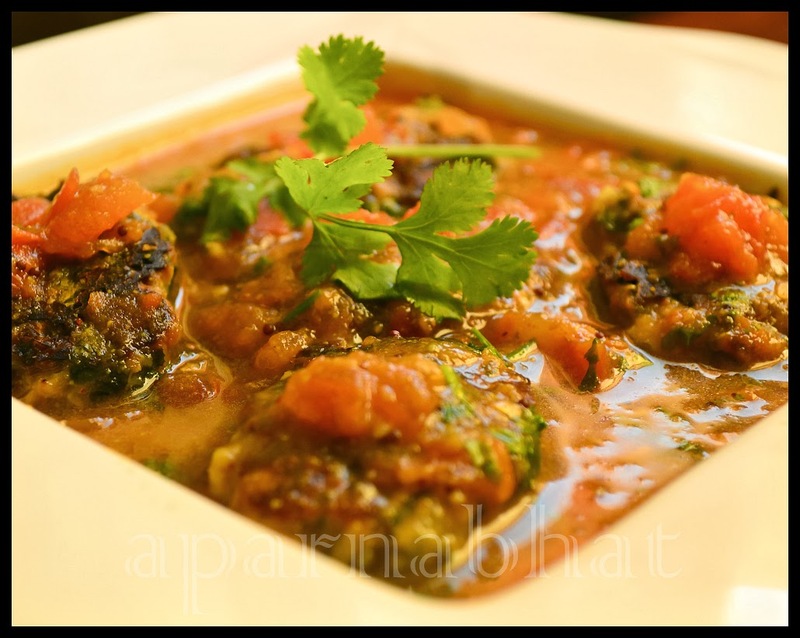 Simmer for 3-4 minutes and then add the chopped coriander leaves, mix again and heat it for a minute. Switch off the flame and serve the curry hot with rice.